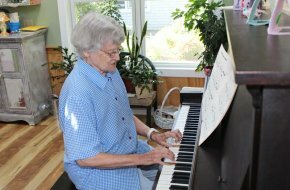 Sunset Home is a non-profit residential care facility dedicated to providing high quality assisted living services for older women in a safe, comfortable, and dignified home-like atmosphere. Welcome to Sunset Home, a non-profit assisted living facility. 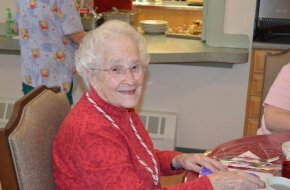 Since 1924, Sunset Home has provided the highest quality care for older women and continues its tradition of hosting a warm and friendly atmosphere in a secure, comfortable, and dignified environment. With a cozy family & living room, screened porches, and paved outdoor walkways, Sunset Home offers all the comforts of home. "I have been at Sunset Home for four years. I love it here. Sunset Home is safe, cheery, bright and inviting. Everyone is valued. 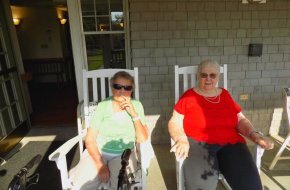 The residents really do enjoy one another and quickly become family, sharing laughter, memories, and friendship. The staff is caring and treats us with dignity and respect as though they are guests in our home, while caring for us, laughing with us, and worrying about us, as if we are their own family. We have an administrator and an active board of directors who truly want to see us all happy. I could not have imagined that assisted living would be this way before coming to Sunset." © Sunset Home of Waterville. All Rights Reserved.